Designed for graduate, advanced undergraduate, and practitioner project management courses with an information technology focus, Methods of IT Project Management is built around the Project Management Body of Knowledge (PMBOK). 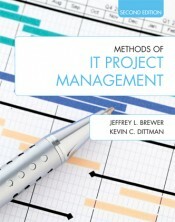 The text provides students with all of the concepts, techniques, and methods found in the leading project management reference books, while also conveying practical knowledge that can immediately be applied in real-world settings. 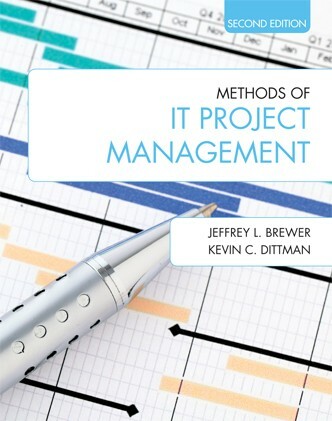 Unlike other books in this field, the material is organized according to the sequence of the project management life cycle from initial overview, through initiation, execution, and control, to close out. Following this life cycle, as opposed to covering the material by knowledge area, allows students to simultaneously learn project management concepts and methods at the same time as they develop skills they can use immediately during and upon completion of the course. The Project Management Professional (PMP) certification issued by the Project Management Institute (PMI) is the world's leading certification in this field. To help students prepare, the authors have dedicated an appendix to practice study questions and give helpful advice on preparing for and passing the PMP exam. At the end of each chapter, the text provides one or more mini-cases based on the theme of a running case study that extends through the entire book. The mini-cases provide additional opportunities for students to apply project management concepts and techniques, and they are ideal for stimulating class discussions and debates. In addition, these cases also present thought-provoking scenarios to challenge the more advanced student. Jeffrey L. Brewer is an associate professor of Computer and Information Technology (CIT) at Purdue University. His teaching and scholarly interests cover systems analysis and design, computer-aided software engineering (CASE), agile development methodologies, and Telecare/Telemedicine. Before joining Purdue, Brewer spent nineteen years working in industries including specialty retail, manufacturing, and most recently as the IT director for the American Association of Nurse Anesthetists in Chicago. He is a certified Project Management Professional.